Barbara Rush (born January 4, 1927) is an American actress. In 1954, Rush won the Golden Globe Award as most promising female newcomer for her role in the 1953 American black-and-white science fiction film, It Came From Outer Space. Later in her career, Rush became a regular performer in the television series Peyton Place, and appeared in TV movies, miniseries, and a variety of other programs, including the soap opera All My Children, as well as starring in films including The Young Philadelphians, The Young Lions, Robin and the 7 Hoods and Hombre. Rush was born in Denver. Her father, Roy, was a lawyer for a Midwest mining company. She grew up in Santa Barbara, California. She attended the University of California, Santa Barbara and graduated in 1948. Rush performed on stage at the Pasadena Playhouse before signing with Paramount Pictures. She made her screen debut in 1951. In 1952 she starred in Flaming Feather with Sterling Hayden and Victor Jory. In 1954 she won the Golden Globe Award for "Most Promising Newcomer – Female" for her performance in It Came from Outer Space. Rush starred as the wife of James Mason in the acclaimed 1956 drama Bigger Than Life, in which a school teacher's use of an experimental drug results in his threatening harm to his family. She was the love interest of reluctant soldier Dean Martin in the war story The Young Lions and of ambitious lawyer Paul Newman in The Young Philadelphians. Rush began her career on stage and it has always been a part of her professional life. In 1970, she earned the Sarah Siddons Award for dramatic achievement in Chicago theatre for her leading role in Forty Carats and brought her one-woman play A Woman of Independent Means to Broadway in 1984. She began working on television in the 1950s. She later became a regular performer in TV movies, miniseries, and a variety of other shows including Peyton Place and the soap opera All My Children. In 1962, she guest-starred as Linda Kinkcaid in the episode "Make Me a Place" on the NBC medical drama about psychiatry, The Eleventh Hour starring Wendell Corey and Jack Ging. In 1962–63, she appeared three times as Lizzie Hogan on Saints and Sinners. In 1965, she appeared in a 2-part episode of The Fugitive entitled "Landscape with Running Figures" as Marie Gerard. In 1967, she guest starred on the ABC western series Custer. She often played a willful woman of means or a polished, high-society doyenne. Rush also was cast in an occasional villainess role, as in the Rat Pack's gangster musical Robin and the 7 Hoods (1964) and in the Western drama Hombre (1967), as a rich, condescending wife of a thief who ends up taken hostage and tied to a stake. She portrayed the devious Nora Clavicle in the TV series Batman. In 1976, Rush played the role of Ann Sommers/Chris Stewart, the mother of female sci-fi action character Jaime Sommers, in The Bionic Woman. After appearing in the 1980 disco-themed Can't Stop the Music, Rush returned to television work. She was a cast member on the early 1980s soap opera Flamingo Road as Eudora Weldon. In 1998, she was featured in an episode called "Balance of Nature" on the television series The Outer Limits. In 1989, Rush toured on stage in the national company of Steel Magnolias as the character "M'Lynn". She has continued to make guest appearances on television. In 2007, she played the recurring role of Grandma Ruth Camden on the series 7th Heaven. Rush married actor Jeffrey Hunter in 1950 and divorced in 1955. She married publicist Warren Cowan in 1959, but divorced in 1969. Rush married sculptor Jim Gruzalski in 1970 after meeting at an Engelbert Humperdinck concert at the Greek Theatre. They divorced in 1973. Rush has two children, Christopher Hunter (with Hunter) and Claudia Cowan (with Cowan). The latter is a journalist with the Fox News television channel. As of May 1997, Rush lived in the Harold Lloyd Estate in Beverly Hills, California. ^ a b Warren 1982, pp. 151–63. ^ Monush, Barry (2003). The Encyclopedia of Hollywood Film Actors: From the Silent Era to 1965. Hal Leonard Corporation. p. 654. ISBN 978-1557835512. ^ a b "Barbara Rush Maintains Image". The Beaver County Times. January 16, 1971. Retrieved March 10, 2016. ^ Turner, Diane (September 1, 1967). "Actress Spurns Roles That Disrupt Home Life". Montreal Gazette. p. 8. Retrieved October 13, 2014. ^ "UCSB Notable Alumni". UC Santa Barbara Alumni Association. Retrieved March 10, 2016. ^ Kaufman, Dave (1968). TV 69: Who's Who, What's What in the New TV Season. New York: Signet. p. 137. ^ "Barbara Rush Named Chicago Actress Of Year". Park City Daily News. July 15, 1970. Retrieved March 10, 2016. ^ Hyman, Jackie (March 6, 1982). "Barbara Rush Insists On Glamorous Image". The Schenectady Gazette. Retrieved March 10, 2016. ^ Stack, Peter (May 25, 1997). "Barbara Rush Still Striking Gold". San Francisco Chronicle. Retrieved March 10, 2016. 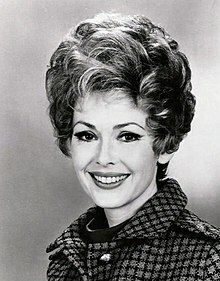 Wikimedia Commons has media related to Barbara Rush. This page was last edited on 15 February 2019, at 21:28 (UTC).